AP Chandarana Productions didn’t let a little matter such as Kericho, its home base, being miles from the sea stop it from launching a label dedicated to taarab, the music of the East African coast. 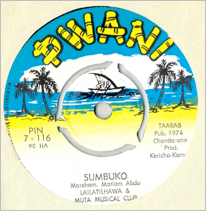 Tracks by Matano Juma and Orch Morning Star appear on the Buda Musique CD collection, Zanzibara 2: 1965-75 the Golden Age of Mombasa Taarab. It’s likely that tracks on that CD by Zuhura and Party are by the Zuhura Swaleh who features here. Muta Musical Club ,on the other hand, appear to be from Tanzania. All of these singles are in the Voice of America collection.